Tripel: This is one of my favorite styles. I've made this four times now and still haven't made a beer with the right fruity, spicy, slightly sweet flavor I want. As I write this, I have one of these in the secondary fermenter. Quadrupel: I've not attempted this style yet. I had found a very promising recipe online but can't find it now. Dubbel: I've not attempted this style, until now. Strong Dark Ale: I've attempted this one once. It was drinkable but had no recognizable Belgian style elements to it, so I was disappointed. 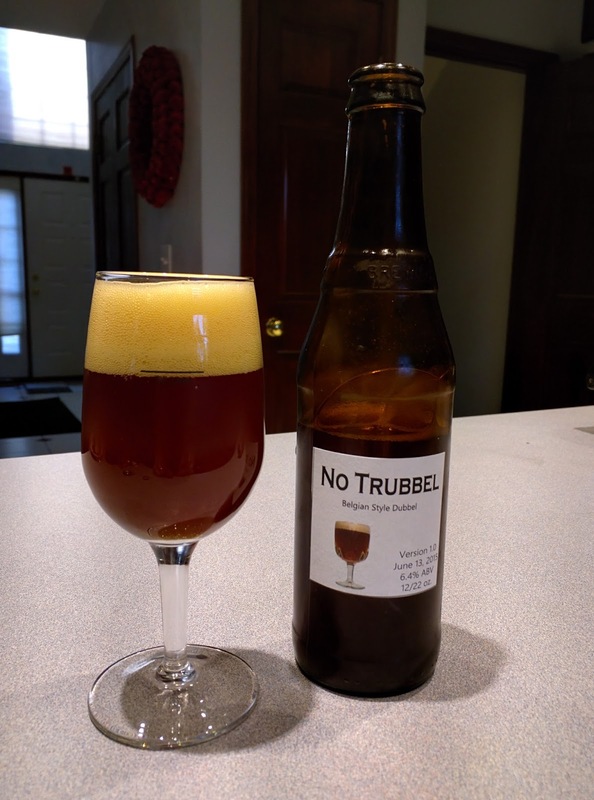 When I found a Belgian Dubbel recipe recently that sounded really good, I realized that I probably had all the ingredients I needed except for yeast, and that was actually on order from Midwest Supplies. A few days later, the yeast arrived along with a 5-gallon economy kettle I wanted for brewing 2.5 gallon batches. As it turned out, I didn't have the Special B grain, so I made a trip to Gentile's Wine Sellers (a local homebrew shop here in Columbus) and picked up a pound plus a vial of White Labs WLP530 Belgian yeast (rather than the dry yeast I'd planned to use). Cleaned and sanitized my kettle, fermenter, airlock, and other tools. Filled the kettle with 2.5 gallons of filtered water from the tap. Inserted the grain bag in the kettle (without grain). Heated the steeping water to 160 degrees Fahrenheit, then moved the kettle to a different burner on my stove, set on low. Past experience has shown me that this will tend to keep the kettle within 1 degree of the temp it's at when I move it over to this burner. 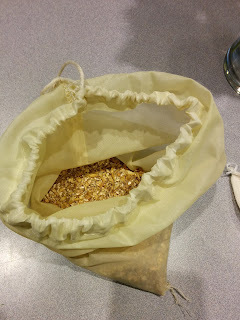 Added the specialty grains to the grain bag and stirred to ensure they all got wet. The kettle temperature dropped to around 154-155, as I expected. It stayed there for the remainder of the steeping process, but I monitored every 3-5 minutes to be sure since I've ruined steeps in the past by getting them too hot. 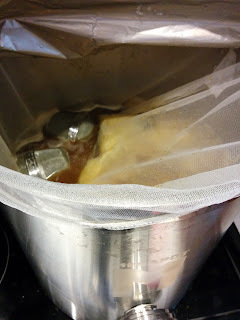 With the steeping finished, I moved the kettle off the heat and removed the grain bag. At this point, my wife and I needed to leave the house, so I put the kettle back on the (now turned off) burner and let it sit there until we returned a few hours later. I hoped this would give the enzymes time to convert more starch to sugar. When we returned home, I turned on the burner and brought the kettle to a boil. I opened the 4 pound can of Pale LME and added it to the kettle. I also added a hops ball filled with the Styrian Goldings pellets and began a timer for 60 minutes. At 30 minutes, I took a couple of large spoonfuls of wort and used them to rehydrate the Irish Moss and dissolve the yeast nutrient. After 45 minutes of boiling, I put my wort chiller into the kettle. I added the Irish Moss and yeast nutrient. After 55 minutes of boiling, I added a hops ball with the half-ounce of Hallertau hops pellets for aroma. I also added the half-pound of Brun Fonce Candi Sugar. When the boil hit 60 minutes, I turned off the heat and removed the kettle from the burner. I then began pumping cold tap water through the wort chiller to cool the wort. About 20 minutes later the wort was down below 78 degrees Fahrenheit. I transferred it to my fermenter, and added water to get the volume to 2.5 gallons. I then inserted my oxygen stone and oxygenated the wort for 90 seconds to give the yeast a good living environment. I pitched the yeast and used a sanitized spool to stir everything up and mix in the yeast well. 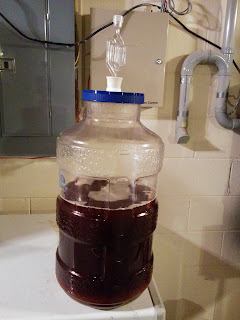 I sealed the 6.5 gallon fermenter and inserted an airlock filled with Star San. The fermenter was moved to my basement, which tends to remain at around 68 degrees year round, so it's good for fermenting beer. The beer fermented from June 13 to June 25. At that point, the gravity seemed to level off, so I used D-45 Candi Syrup to prime it for bottle conditioning. That was on July 3. It's now July 20 as I write this, and the beer is definitely finished. I can't speak for other homebrewers out there, but I've often been frustrated when I find beer recipes (like this one) online. 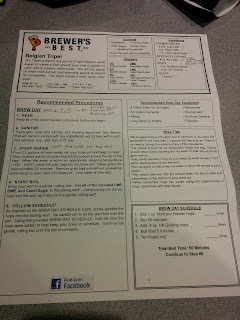 The brewer will give us painstaking details on how they brewed the beer, but not tell us how the beer turned out. So we have this recipe in front of us that might produce the greatest beer ever, or something mediocre, or something awful. We just don't know. 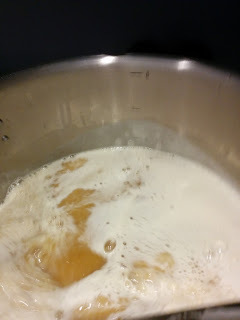 So my plan for the Begin Brewing blog is to come back and edit articles like this to tell you how the recipe turned out, what was good and bad about it, and what I'd do next time differently (if anything). This particular beer turned out the perfect color and clarity, to my eye, for a Belgian Dubbel. (See the photo at the left.) It's a nice reddish mahogany color with a bit better than finger-thick head that's tan in color. The head lasts for several seconds (maybe 15 or so) before reincorporating into the beer. The aroma is yeasty, like most homebrew beers that are bottle conditioned. There is a hint of caramel in the aroma and a touch of dark fruit like prune. There is a little bit of a perfume note to it. The flavor turned out malty, but with what I think is a perfect hops balance for a Dubbel. You'll definitely know there's hops in it, but this isn't a hoppy brew by any stretch. There is a hint of the Belgian dark fruit (prune or similar) in it, but it's not as pronounced as it could be. There isn't a lot else to the flavor. If I'd been handed this (and didn't know what it was), then asked to review it on a 1 to 10 scale (where 10 is fantastic), I'd probably give it a 7. It's good, but it could definitely be better. The Sugar: I used Brun Fonce candi sugar in this beer. While it didn't ruin the beer at all, it didn't contribute much to the flavor. I tasted some of the beer while it was flat, before bottling it, and felt that it was decently balanced but boring. I used D-45 Candi Syrup to prime it before bottling, and that amped up the Belgian flavor a little bit. I'm hoping that additional bottle conditioning may improve on that (Update: It did. Each week I've opened a bottle it seems to have gotten better.). Either way, the next time I brew this beer I will definitely follow the advice of a local professional homebrewer and use Candi Syrup. He said that the syrup provides a better flavor than the rocks or granulated stuff, and I think he's right. I might consider priming it with Brun Fonce, but I'll definitely brew it with the syrup. Although the original recipe called for more hops than I used, I would not adjust this. Even if the Candi Syrup provided a touch more sweetness in the next batch, the hops should still be pretty well balanced as-is. I might also try to monitor and control temperature a bit differently in the fermentation process. In this case, I left it in the primary sitting in the basement with no thermometer or heating/cooling. It doesn't seem to have harmed the beer at all, but I have to wonder if better temperature control would have improved it... or if keeping it closer to the top end of the yeast's tolerance near the end might have generated additional esters and phenols common in the style. While all-grain brewing is generally less-expensive and often produces much better results than extract brewing, there are plenty of times where you simply want to produce a drinkable beer and don't want to put the time and effort into an all-grain batch. When this happens, you'll want to convert an all-grain recipe to extract. Similarly, there may be extract recipes that sound good, but you want to reduce the cost and improve on the quality. In those cases, you'll want to convert the extract back to an equivalent of whole grain. Conversion from extract to grain or vice-versa is the most difficult. That's not because it involves complex math, but because extract manufacturers don't share the recipe for their extract wort. That means you won't know for certain which grains were used or in what amounts. All you can really do in these cases is approximate. 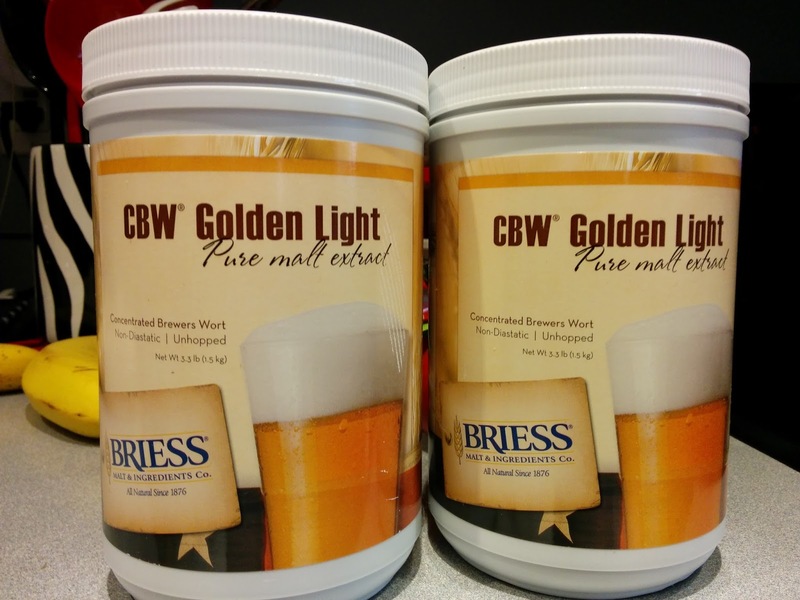 BYO Magazine suggests that you can use specialty grains to closely approximate any malt extract on the market. Look at the specifications for the light malt extract. Find the points per pound figure. This will usually be 36 (1.036). Look at the specifications for the two-row malt grain. Identify its points per pound figure. If your brewhouse efficiency is 75% (which is common), your yield is 75% of the figure in the previous bullet. Multiply the weight of extract by the ratio of points from extract over points from grain. Thus, you'll need 12 pounds of 2-row malt to equal 9 pounds of extract, at a 75% efficiency. If you're looking at a more complex extract like Amber, Dark, or Wheat, you have a lot more work to do. The BYO Magazine article linked above explains the process better than I can. It boils down to examining the manufacturer's specifications for the extract and inferring what you can from it about the grains they used to make it. The main difference between DME and LME is the amount of water. Water content in LME tends to be around 20%. In DME, it's essentially zero. To do the conversion, 1 pound of a DME is approximately 1.2 pounds of an LME. To go the other way around, 1 pound of LME is equal to 0.8 pounds of DME. If you're a fan of hop-forward beer styles like IPAs, Pale Ales, and Imperial ales, you're probably not going to be interested in this post. Those styles tend to benefit from fresh hops, and as much of them as you can infuse into the beer. There are other beer styles, like Belgian ales, lambics, and others which aren't hop-forward in nature. These beers can benefit from more-subdued hops bitterness and flavor which allows their malt character to shine through. This is where aging can make a difference. Although I'm familiar with aging wines, cellaring certain beer styles to allow them to age, and even bottle conditioning some home brews to improve the flavor, I'd never heard of aging hops. At Barley's 20th Annual Meet the Brewers event, I met brewmaster Sam Hickey of Smokehouse Brewing and Lenny Kolada (a co-owner of Smokehouse). Sam was there with his Brewtus Maximus Belgian Quadrupel (which is an absolutely excellent beer). I told Sam that I'd brewed three batches of Belgian tripel over the year and they just weren't working out to my taste. The first used UK Goldings hops and had an unusual bite to the bitterness that I didn't like. The second used the same recipe, but swapped the UK Goldings for a blend of Styrian Goldings for bitterness and Czech Saaz for flavor and aroma. That one got much closer to what I wanted, but still wasn't quite right. The third, which I just put in the fermenter a few days ago, used Northern Brewer, Stryrian, and Saaz. It also used a different combination of malts and sugars, plus sweet orange peel and coriander. When he heard my frustration at getting the bittering right, Sam suggested that I might want to look at aging the hops. I told him I'd not heard of that. As you're probably aware, the bitter flavoring we normally associate with hops comes from the acids in the hops cones. As these acids are exposed to oxygen, they break down and lose some or most of their bittering capability. Fortunately, they retain their ability to prevent infection in the beer, which is useful in styles where the bittering isn't as important - like wheat beers, Belgian ales, and others. Aging hops takes away some of the flavor as well. To age hops, simply leave them in a dry place like an attic for one to three years. Keeping them in a brown paper bag is a good way to keep them relatively clean during the aging process. 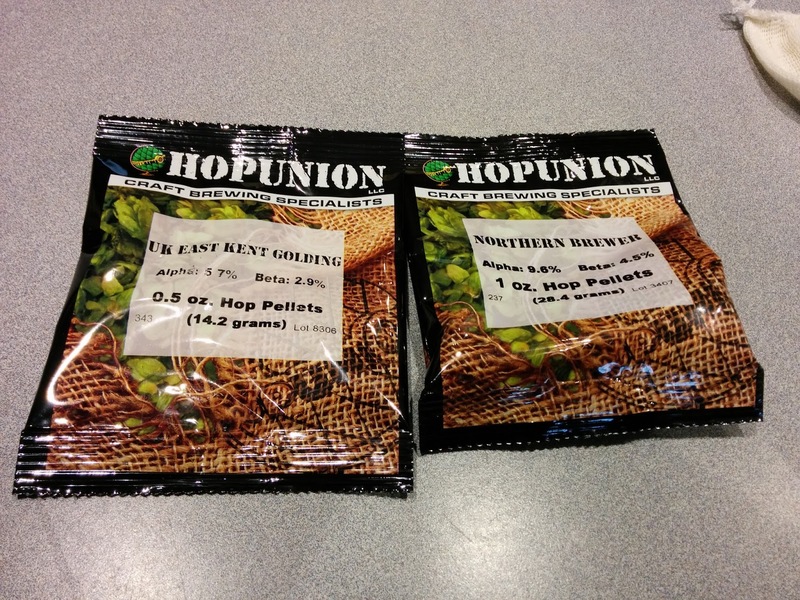 Aging generally requires whole leaf hops, as pellets don't age as quickly. Hops aging can be accelerated by placing the hops in a 150-degree Fahrenheit oven for up to twelve hours. The down-side to this is that it can create a very intense aroma in the house that lingers for days. There are some suppliers that offer aged hops. Hops Direct, for example, offers aged hops at a variety of prices in the $5-10 per pound range. 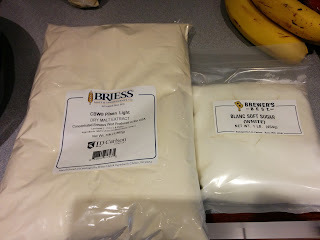 A few weeks ago, I visited a local homebrew shop and decided to support them by picking up a Brewer's Best Belgian Tripel extract brewing ingredient kit. I'm a big fan of the Belgian Tripel style and have yet to find a recipe that I am happy with. The ones I've made have come out too sweet, too bitter, and often with a bitterness that doesn't match up to a genuine Belgian Tripel such as Karmeliet. I decided to try out the Brewer's Best kit. Start the boil and add the LME, DME, and sugar once at a rolling boil. Off the bat, I decided I needed to change this up. I once made a tripel using UK Goldings hops and I didn't like it. The bitterness and flavoring it imparted didn't taste right to me. It didn't match up to some of my favorite tripels like Unibroue's La Fin Du Monde or Karmeliet Tripel. Fortunately, I had some Czech Saaz and Styrian Goldings hops around that I could use instead. A quick check in Beer Tools Pro said that I had enough to achieve the bitterness goal, so I replaced the Goldings with these two other hops that are more traditional in Belgian brewing. I left the Northern Brewer hops in, because I've had American-made tripels using that variety and they tasted fine to me. I dialed the amount back, though, because Beer Tools said I'd wind up with an estimated IBU well over 40. That's too bitter for my taste. Having made that change, I also decided to follow down the path of La Fin Du Monde a bit more, and added a half ounce of coriander and a half ounce of sweet orange peel into the mix. Because I've significantly altered the Brewer's Best recipe, I'm not going to comment on the flavor of the finished beer. If it turns out badly, perhaps that's because I made a bad choice modifying the provided hops types and amounts (and/or adding the flavoring components). If it turns out well, maybe it would have with their ingredients, or maybe not. So for the rest of this post I'm going to comment only on the kit itself and how the brewing experience went. The next step is to steep the specialty grains. In this case, that was 4 ounces of Belgian Aromatic malt. I took a 2-gallon pot out, filled it with water, and heated it to 155 degrees Fahrenheit. Then I placed the Aromatic malt in a bag and dropped it into the pot. I then monitored the pot for the next 20 minutes while the malt steeped. It gave off a nice biscuit/cracker aroma. I then removed the grain bag from the water, turned off the heat, and transferred this weak wort to my brew kettle. The instructions are based on a 2.5 gallon boil. I wanted to do a full 5-gallon boil, so I added water to the kettle to get it to just below the 5-gallon mark. 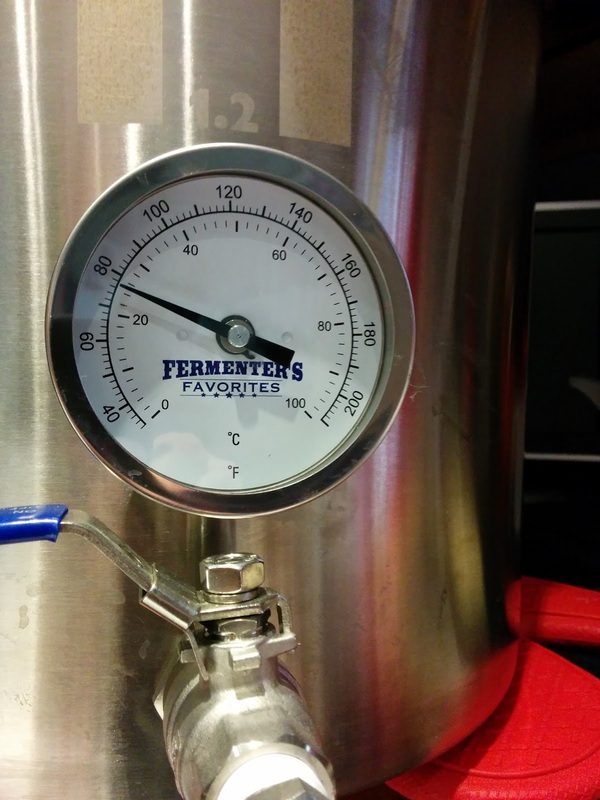 I knew that by the time I added LME, DME, sugar, and hops, we'd be well above 5 gallons. Then this would boil down somewhat, hopefully to very close to 5 gallons. The instructions tell you to bring the water to a boil and add the LME, DME, sugar, and Northern Brewer hops. Past experience told me that added the extracts early in the boil was likely to result in a darker beer. The tripel style is usually a lighter one, yellow or gold in color. However, trying to give the makers of the kit the benefit of the doubt, I added the extracts as instructed. 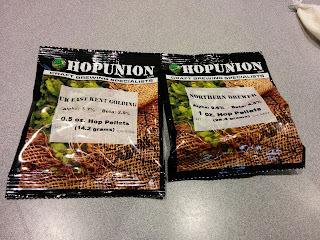 I also added the 0.55 ounces of the Northern Brewer hops in a bag. As you can see below, it does look the right color for a Belgian Tripel at this point. The next step is 50 minutes of boiling. After this, you're supposed to add the UK Goldings. In my case, I added an ounce of Czech Saaz hops (3% alpha acid). I also added yeast nutrients. 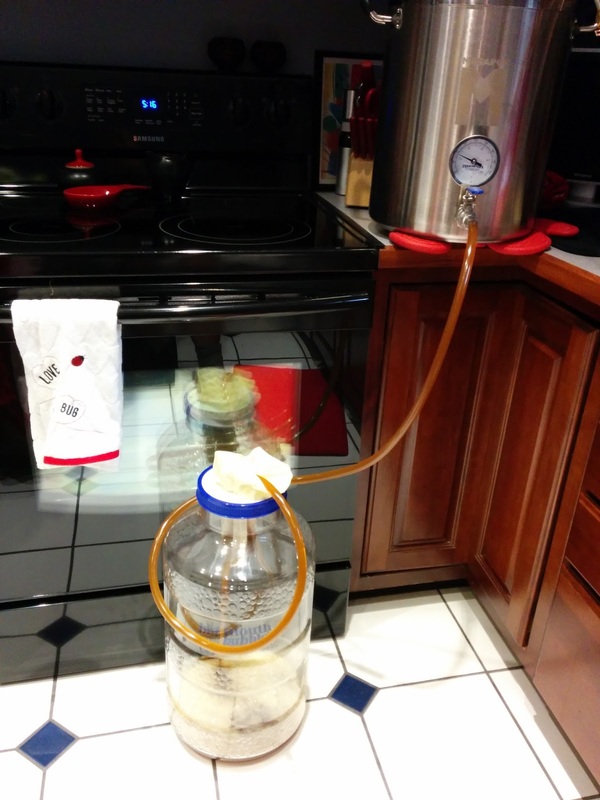 I also inserted my Silver Serpent immersion wort chiller to sterilize it before cooling the wort. If you are wondering why the second hops addition is inside the metal ball, it's because I noticed that the original Northern Brewer addition was leaching particulates into the kettle, which I didn't want. I decided to add the next two additions in the hops balls to be safe. With 5 minutes left in the boil, I added the coriander seeds, sweet orange peel, and Styrian Goldings hops pellets. These were all placed in the same hops ball. About a minute before boil time was up, I turned off the burner on the stove. (It's an electric burner, so there was more than enough residual heat to finish up.) Then I took the kettle off the stove and started pumping cold water through the immersion chiller. 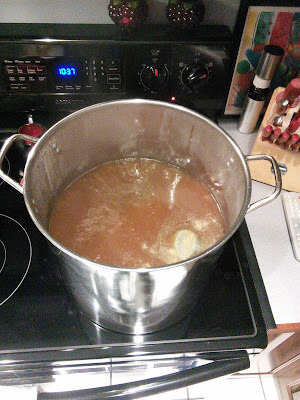 It took about an hour to drop the temperature from boiling to pitching temperature. I attached a hose to the valve on the kettle and into the fermenter. I then used natural suction and gravity to transfer the wort. 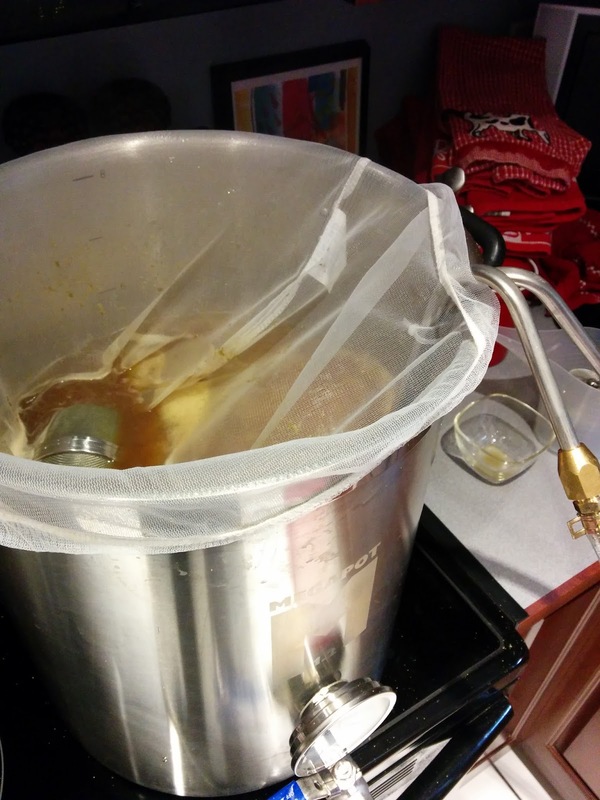 As you'll see in the image below, I tried to filter out the particulate matter with a hops bag, but this didn't flow enough liquid and I had to abandon the idea. Eventually, the wort was transferred and the fermenter was filled to about the 4.5 gallon mark. This was a bit puzzling to me since it had been registering just under 5 gallons on the markings etched into the kettle. I assume the displacement of the wort chiller and the fact that there is an intentional space under the valve (to avoid picking up particulate matter) accounts for this. 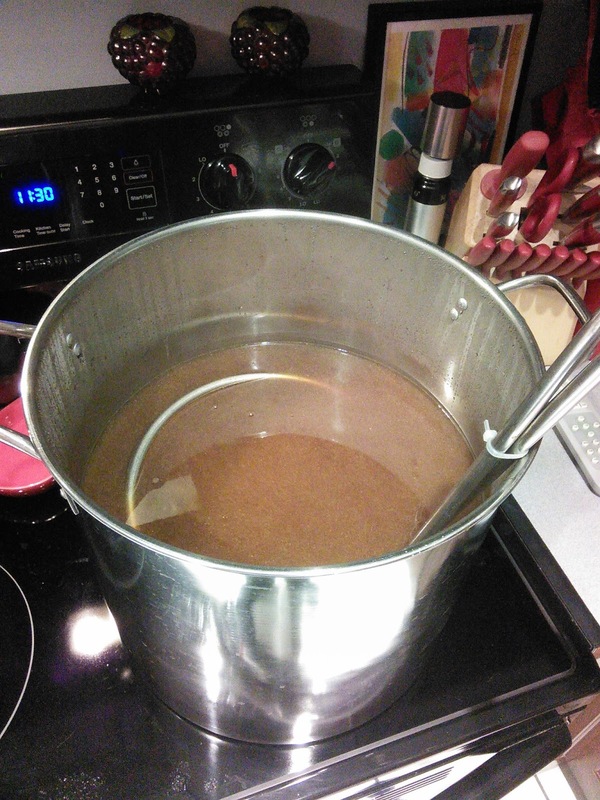 As you can see in the image above, the color of the wort grew considerably darker later in the boil. This is why I've changed my practice to adding malt extract during the last 15 minutes of the boil for lighter colored beers like this. Unfortunately, this tripel's going to be a dark one, which knocks it out of the guidelines for the style. Fortunately, I brewed it to drink, not to compete. Although not mentioned in the instructions, I took out my oxygenator and gave the wort two minutes of oxygen to ensure that the yeast had plenty to work with in this high-gravity beer. 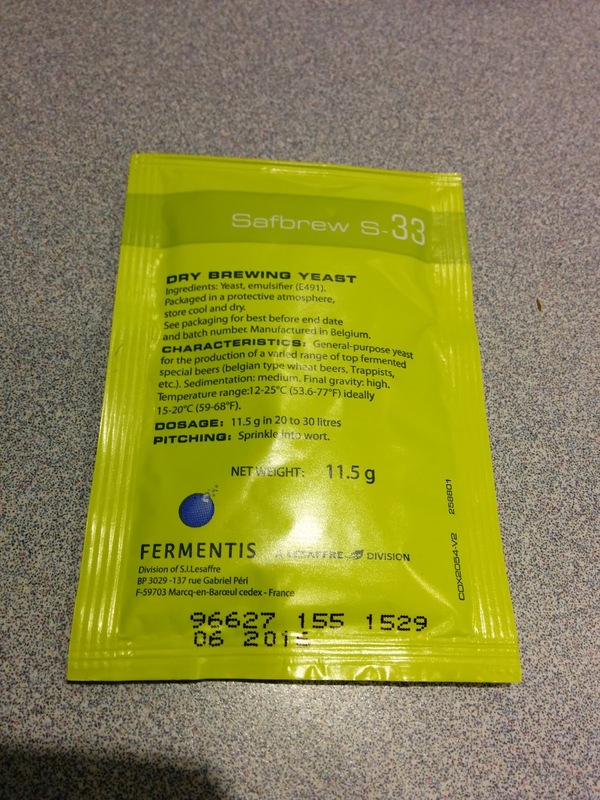 As mentioned earlier, I also added yeast nutrient to help get the dry yeast working. I finished brewing this beer and transferring it to the fermenter at about 5:30pm today. As I write this, it's 8pm and there is already activity in the airlock, so I think it's safe to say that the yeast are happy in their new environment. One of the things I wanted to do with Begin Brewing that's different from some brewing blogs is to go back and tell you about the finished beer. Too often, brewers get excited about the beer they're working on and say they're coming back to tell you about it when it's done, and don't. The result is that you have a recipe in front you and no idea if it's good. It's now late July. I made the beer in June, and published this post in early July. The beer has been in bottles now for at least two weeks. It spent probably four weeks in the fermenter. It was then bottled using Fementer's Favorites carbonation drops into cleaned and sanitized bottles. The flavor of the beer is excellent. It's definitely one of the better tasting brews I've made. Where this one is falling down (and I want to make it clear that I do NOT believe this is the fault of the Brewer's Best kit) is that it's not carbonating. I've opened three bottles, one after a week of conditioning and two after two weeks. All three were flat as the day they were bottled. My best guesses at "why" were that either the caps were old and didn't seal properly, the yeast had killed itself by generating 11% alcohol by volume during fermentation, or the yeast had simply flocculated into the bottom of the fermenter and almost completely out of suspension in the beer. To test the flocculation theory, I grabbed the last four bottles to come from the fermenter (which doubled as my bottling bucket) and contained the most yeast post-fermentation. I moved these to one of the warmer rooms in the house (where I hoped the yeast might activate and carbonate the beer). I'm planning to wait two weeks before opening them. Update: This worked for at least the four bottles I moved upstairs. I also tried a Belgian brewer's technique. I opened most of the bottles and added some dry Montrachet wine yeast. While waiting, I reached out to the staff at BYO magazine to see if they had any ideas. They were great, and responded immediately. They said the caps were unlikely to be the problem. Flocculation and spent yeast were more likely. Their suggestions were to move the bottles to a warmer location, something in the 80 degrees Fahrenheit range, and give them two weeks there. If that didn't work, I could try opening the bottles, putting in a little dry wine or champagne yeast, re-capping, and giving the new yeast a chance to do its thing. Those are my next steps. I'll come back and update this post when I know more. Here are my thoughts on this particular Brewer's Best kit. I like the fact that everything is included in the box, and that it's all pre-measured to match the needs of the recipe. When you buy the ingredients online, you're often limited to buying a pound of grain when you need a few ounces, or a whole ounce of hops when you need part of an ounce. Kits like this minimize the waste or accumulation of extra ingredients around the house. That's good. The price was reasonable given what's in the kit. Pricing the same items out, and adjusting the price so that I'm counting only what would be used in the recipe (e.g., you have to buy an ounce of hops at $2.49 but only need a half ounce, so I counted $1.25), it worked out to a total of $45.23. Then you have to toss in the priming sugar and bottle caps. That comes out right about where the kit is priced ($50 plus tax). The instructions included with the kit are complete. Tips are provided for several steps, suggesting that you might want to do a larger boil, make sure the grains can move around in the steeping bag, keeping the steeping temperature in range, etc. I take a small exception to the fact that they tell you there's no real difference between doing a 2.5 gallon boil and adding water in the fermenter, and doing a 5-gallon boil. 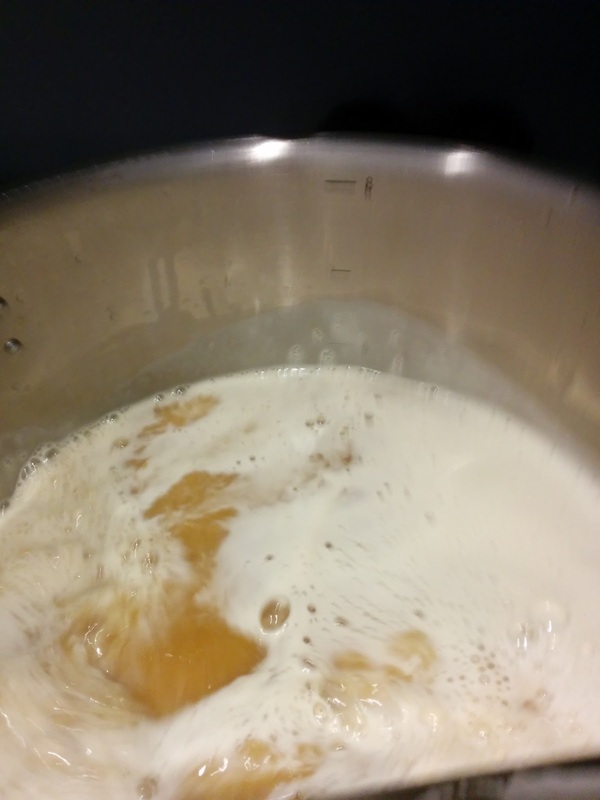 Hops utilization is impacted when you have a smaller boil size, so doing a full 5-gallon boil would actually make the beer more bitter than a 2.5 gallon boil. For a beer style like an IPA, Pale Ale, or Imperial Stout, that extra bitterness might be just fine. For styles like the Tripel, which generally are not bitter when brewed in Belgium, that difference in bitterness could turn a delicious beer into something a little nasty. All things considered, I am happy with the kit. That might sound strange, considering that I swapped out one of the two hops varieties and added a couple of additional ingredients to it. If this had been the first tripel I'd ever brewed, I would have followed the instructions and used the ingredients in the kit as directed. 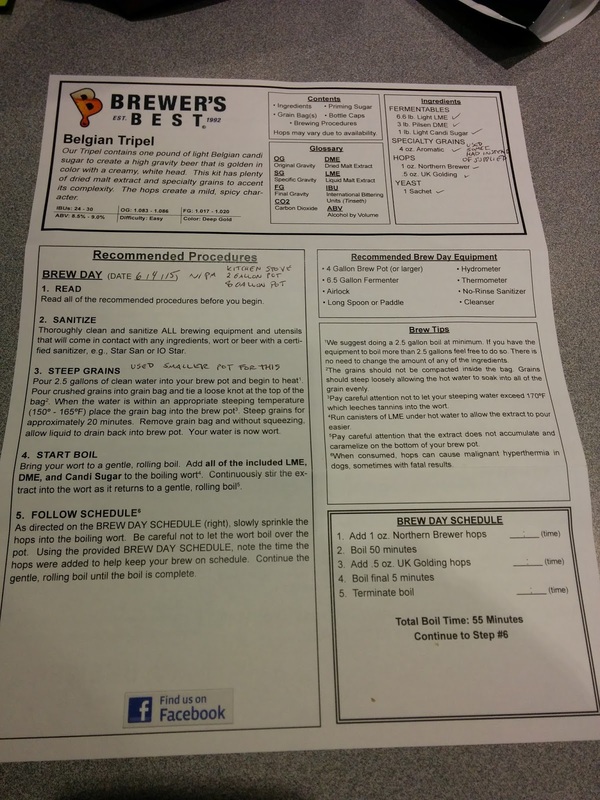 I suspect that I'd have had the same results I had with my very first tripel recipe that wasn't made from this kit. That UK Goldings bitterness would have bothered me, and I'd probably have concluded that an ounce of Northern Brewer hops at 9.6% alpha acid was too much for my taste. So I'd have bought the ingredients to do it again, swapping out the hops (as I did here) and adding in the coriander and orange peel (which I've learned are used in a favorite pro-brewed tripel). I don't blame Brewer's Best for not tailoring the kit to my personal taste, and I don't hold it against them that they made choices that perhaps 99% of the other people buying this kit would be happy with. That said, I won't buy this exact kit again. When I am ready to brew a new beer style that I've never made before (e.g., a sweet stout), I would certainly consider picking up another Brewer's Best kit. I would consider these a "starting point" to developing a recipe for the style that matches my taste. The price is reasonable, there aren't any wasted ingredients, and you have the benefit of any tips or tricks they include in the instructions.